Do Your Articles Deliver What You Promise? Ask Elvis. We've all heard that content is king on the Internet a hundred times. But it seems like there are also 10 different interpretations of this cliché. Some believe that quantity prevails over quality. Others think that putting up free content is better than nothing at all. And then there are the savvy marketers who acknowledge that content needs to be useful and relevant. Meta descriptions need to accurately portray the content that you will deliver. It’s pretty standard knowledge that controversial headlines are the way to get click-throughs for articles and lead nurture emails. After all, there’s a sea of [sometimes useless] information floating around on the Internet. How will your article be selected by the ‘clicker’ or your email see the light of day when it’s competing with other junk mail? Situated Research’s blog article, Five Ways to Get 20,000 Views to Your Posts illustrates the writer’s measurable success when she started incorporating words like ‘moron’ and ‘idiot’ in her headers and cites a highly read article entitled, “How a Homeless Guy Named Patrick Taught Me About Social Media.” If this isn’t evidence that tabloid-style shocking headlines are successful, nothing is! Should we borrow a page from tabloid magazines? Are shocking headlines the way to go? Here’s the deal: only if you can seriously deliver in your content. If gathering clicks is your only goal, then a great title is fine. But internet readers are onto deceptive headlines now. Your reputation is on the line! 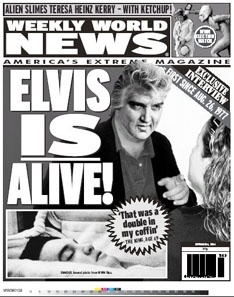 Do you believe National Enquirer any more after reading their headlines about alien abductions and Elvis sightings? How disappointed are you when you find a compelling title or meta description describing your search terms exactly, only to find the article completely useless? Credibility is compromised and people won’t believe your next headline. And the difference between tabloid magazines and internet content is that a shocking magazine headline converts to a $2.99 sale. An article that doesn’t live up to its title angers your potential prospects. Next, you’ll have to do damage control! When are you willing to fill out a form? You know what’s at stake - more emails in your in-box to delete. Unless, of course, they grab your attention and promise to benefit your life. So, the whitepaper downloads that are most useful to your prospects are the ones that they can use today ... coupons, giveaways, money-saving offers, how-to guides, tools/templates or anything they can’t find within 2 minutes of searching Google. Here’s a great example of an amazingly useful whitepaper by Rick Segel that could bring prosperity to a business owner is he/she is willing to follow instructions: Write a Book…Change Your Business (Without YOU Writing a Word.) I can think of a handful of forms I’ve filled out hoping to receive valuable information only to end up with goose eggs. Have you ever filled out a form, only to be left empty in the end?